Go to original pattern for design DROPS 66-10. 90% mohair, 10% polyester, 50 g./95 m.
600-650-700 g. col. no. 19, dark grey-blue. 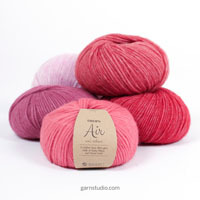 100% wool, 50 g./110 m.
550-600-650 g. col. no. 02, brown. DROPS 8 mm circular needles, or size needed to obtain correct gauge. 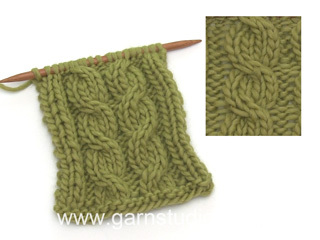 Gauge: 10 sts x 14 rows with 1 strand Vienna and 1 strand Ull-Tweed in stockinette st = 10 x 10 cm. 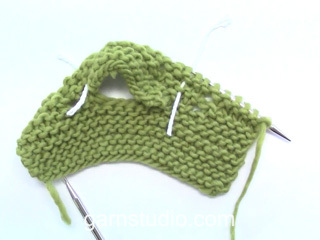 Buttonhole: for buttonhole, bind off the third st from center front, cast on 1 new st over the bound off st on the next row. Make buttonholes when the piece measures 40-45-50 cm, 53-58-63 cm, 65-70-75 cm, 78-83-88 cm, 90-95-100 cm, 103-108-113 cm and 115-120-125 cm. Knitting tip: The measurements on the schematic refer to the measurements in the written pattern, measured when piece is lying flat. Because of the weight of the garment, it will stretch approx. 15 cm longer when worn or hanging. Body: Cast on 138-146-154 sts (including 5 edge st at each side for button bands) with 1 strand Vienna and 1 strand Ull-Tweed. 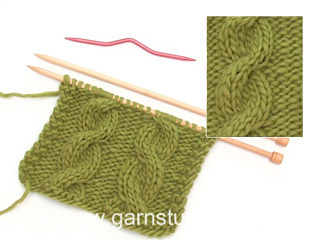 Knit 2 rows garter st, increasing 16 sts evenly distributed across the second row = 154-162-170 sts. On the next row, establish pattern as follows: 5 sts garter st (button band), 7-8-9 sts Pattern 1, 14-14-14 sts Pattern 2, 15-16-17 sts Pattern 1, put in 1 marker (the side), 15-16-17 sts Pattern 1, 14-14-14 sts Pattern 3, 14-16-18 sts Pattern 1, 14-14-14 sts Pattern 2, 15-16-17 sts Pattern 1, put in 1 marker (the side), 15-16-17 sts Pattern 1, 14-14-14 sts Pattern 3, 7-8-9 sts Pattern 1, 5 sts garter st (button band). Work in pattern as established. When the piece measures 20-20-20 cm dec 1 st at each side of each marker (dec 4 sts total) = 150-158-166 sts. Repeat decreases every 10-11-12 cm a total of 5-5-5 times = 134-142-150 sts. When the piece measures 72-76-81 cm put 4 sts at each side on a stitch holder for armhole (2 sts each side of the marker) = 34-36-38 sts on each front and 58-62-66 sts on back. 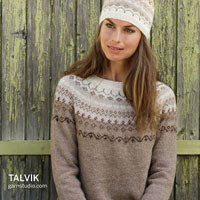 Put aside and knit the sleeves. Sleeve (knit flat): The bottom 10 cm on sleeves folds back for a cuff. Cast on 30-32-34 sts and knit 2 rows garter st. Knit Pattern 1 over all sts. When the piece measures 20-20-20 cm inc 1 st at each side 8-8-8 times every 4-4-4 cm = 46-48-50 sts. When the piece measures 54-54-55 cm bind off 3 sts at each side = 40-42-44 sts. Yoke: Put the sleeves in on the same circular needles as the body, above the sts on a st holder for armhole = 206-218-230 sts on needles. Put 1 marker at each transition between the sleeve and body = 4 markers. Continue with pattern over all sts and shape raglan. 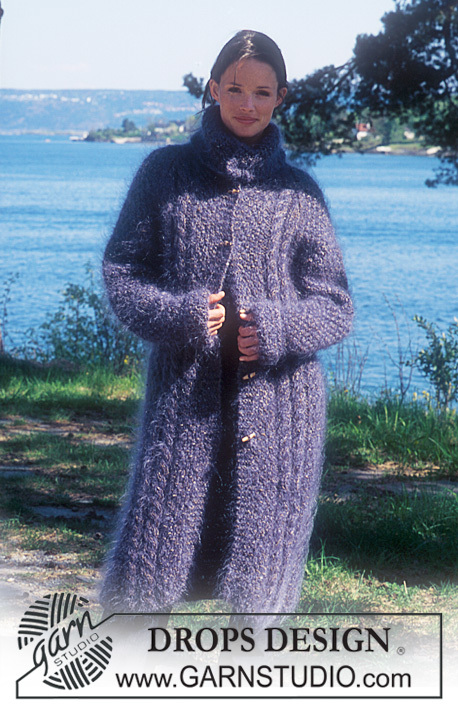 Raglan shaping: Read this entire section before knitting. There are 8 decs per row. Dec 1 st each side of each markers 13-13-12 times every other row, then 6-7-9 times every row. A total of 152-160-168 sts are decreased. Dec as follows on right side: before the marker: K 2 tog. After the marker: slip 1, K 1, psso. Dec as follows on wrong side: before the marker: P 2 tog. After the marker: slip 2 sts off needle, put them back onto left needle twisted (one by one), then P 2 tog into the back of the sts. At the same time: When the piece measures 89-94-99 cm put the 5 button band sts at each side (center front) on a st holder for the neck (the remaining buttonholes are made on the collar). 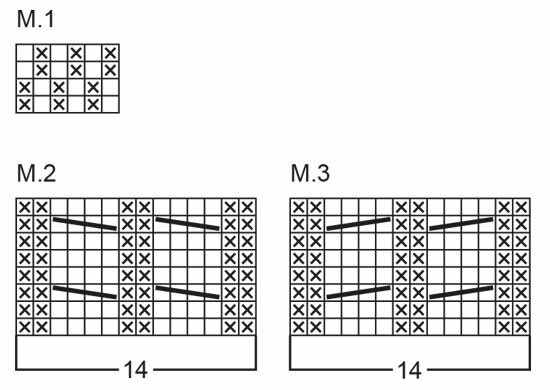 Continue decreasing for the neck every other row: 2 sts 2-2-2 times, 1 st 2-2-2 times. After all raglan and neck shaping is complete there are 32-36-40 sts on needles. 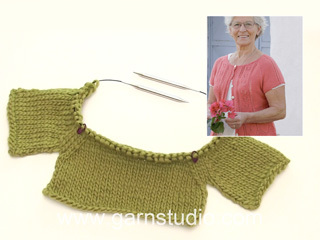 Collar: Pick up 54-62 sts around the neck (including sts from st holders and sts remaining on needles) on circular needles with 1 strand Vienna and 1 strand Ull-Tweed. Knit Pattern 1, but the keep the 5 button band sts at each side in garter st. Remember to make the remaining buttonholes. When the collar measures 10 cm knit 2 rows garter st, increasing 6-6-6 sts evenly distributed on the second row (don’t increase over button bands). Continue in Pattern 1 until collar measures 15 cm - measured from garter st, then bind off all sts. Assembly: Sew sleeve seams and sew the opening under the sleeve. = put 2 sts on st holder in back of work, K 2, K 2 from st holder. = put 2 sts on st holder in front of work, K 2, K 2 from st holder. Ich möchte gerne diesen Mantel nachstricken. Leider sind die Garne nicht mehr erhältlich. Auch bei den von Ihnen angegebenen Alternativen sieht es schlecht aus. Haben Sie noch andere Garnalternativen? Vienna (Garngruppe D) können Sie durch 3 Fäden der Garngruppe A ersetzen, hier würde sich für den Flauschcharakter Kid-Silk anbieten. Anstelle von Ull-Tweed können Sie eine der drei Wollgarne aus Gruppe B verwenden (Lima, Karisma oder Merino Extra Fine). Sie müssen anhand der Originalgarne die gesamte Lauflänge für Ihre Größe errechnen (Vienna 50 g = 95 m und Ull-Tweed 50 g = 110 m). Wenn Sie Kid-Silk (25 g = 200 m, d.h. 50 g = 400 m) 3-fach verwenden, müssen Sie die Lauflänge mit 3 multiplizieren. Beachten Sie, dass es wichtig ist, die Maschenprobe einzuhalten. Underbar! Men kör med dubbel vienna istället.